One of the fastest-growing job sectors in the country pays $10 per hour. That’s a big problem. What kind of economy do we want in this country? This abstract question has been put to the test in concrete ways, most recently with the protests against Walmart. (To catch yourself up, read the fantastic coverage from fellow Nation writer Josh Eidelson.) As the nation’s—and the world’s—largest private employer, it has a huge impact on the economy. But perhaps more importantly, low-wage, low-benefit, unstable service sector jobs like those in Wally World are our economic destiny. So more than just the job quality for striking Walmart workers is at stake; the quality of one of the fastest growing job categories is also being decided. There’s another area where this couldn’t be truer: domestic work. 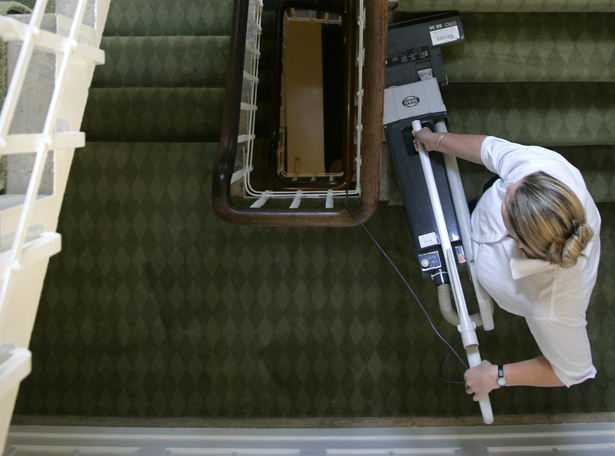 The nannies, elder caregivers and housecleaners of today inhabit a rapidly growing occupation. As the baby boom generation ages and women continue to seek work outside the home, these jobs will become even more critical—and in demand. No wonder that the Bureau of Labor Statistics predicts that home care aide jobs will grow by 70 percent, far faster than most occupations, over the next decade. While harder to track, domestic workers’ jobs are also on course for that rate of growth. So what do these jobs look like? Unlike the conditions at Walmart, which while not the most transparent company is still under the watch of federal labor regulators, domestic work is performed in the home, exempt from many labor laws and mostly made invisible. Until now. The National Domestic Workers Alliance released a groundbreaking survey this week of over 2,000 nannies, caregivers and housecleaners in fourteen cities across the country (and in nine languages no less) to find out what they were paid, what benefits they were given, how they were treated and what recourse they had to report the abuse that continually crops up against such a vulnerable workforce. The results paint an incredibly ugly picture. Nearly three-quarters of the workforce is paid less than $13 an hour. The median hourly wage is $10 an hour, with live-in nannies making just $6.76 an hour at the median. (For those following along at home, that last wage comes to just about $14,000 a year.) It’s no wonder, then, that they report enormous struggles to make ends meet. Sixty percent of these workers spend more than half of their income on housing. One in five reported experiencing times in the previous month when there was no food to eat in their households because they didn’t have the money to buy any. Nearly a quarter weren’t able to put away any money for savings. The lack of benefits is just as stark. Sixty-five percent don’t have any health insurance, and a mere 4 percent—one out of every hundred workers—had insurance that was provided by their employers. Yet far from being the easy babysitting jobs Congress imagined these to be when they were excluded from labor laws in the 1930s, this is hard, physical work. Nearly 40 percent had suffered from work-related wrist, shoulder, elbow or hip pain in the last year. About a third of housecleaners had suffered from skin irritation, a third of nannies had gotten sick on the job and a third of caregivers had suffered a back injury. With no insurance, these injuries will either go untreated or mean astronomical medical bills. While service sector workers suffer from unpredictable schedules that mean they can rarely plan their lives around their hours and often can’t get enough hours to make the money they need, working inside the home is a whole different ballgame. Given that few have contracts, the workload can balloon out of control. About a quarter of the workers were told to do work beyond their job descriptions in the previous week. Of these, nearly 70 percent weren’t given any extra pay for the increased time they spent working. And three-quarters didn’t think they were able to refuse the extra work—without labor protections and in such close quarters, they often fear retaliation and job loss. This is the Great Speedup on steroids. These are the jobs that form the bedrock of our economy in more ways that one. At an event to mark the release of the data at the Ford Foundation yesterday, Linda Burnham, the research director for NDWA, pointed out, “Domestic work frees up the time of millions of others” to go into the workforce. But they are of course also a growing and in-demand service that can’t be outsourced. “This is the new work,” said David Roff of the SEIU. “This is the new normal.” Yet that new normal looks pretty dismal. The report is “a catalogue of many things that are wrong with our society in many ways,” said Ana Avendaño of the AFL-CIO, such as the lack of respect and dignity for all workers. Releasing the study might seem like a small step when so many abuses have to be addressed. But it’s a vital one to take toward improving these jobs. As Avendaño put it, “Without it we can’t do the public policy work we need to do.” The first step is knowing exactly what’s happening in this workforce so that it can be addressed. The report includes concrete steps to start addressing the horrors that it exposes, such as ending the labor law exclusions for these workers, educating employers and holding them accountable, better support for the families who need these caregiving services and creating “a more equitable economic environment for all low-wage workers.” Because low-wage work is the fastest growing post-recession category. If these jobs don’t pay enough to keep people out of poverty, we’re all in big trouble. That economic bedrock will look more like quicksand. For more on the fight for a living wage, check out Josh Eidelson’s coverage of the Walmart worker strikes.